Is Pictometry GIS? That is a question that we hear at Dakota County from time to time, especially from other organizations interested in the product. If you aren't already using Pictometry in your organization, the question you may be getting from your sheriff, assessor, parks or public works staff is, "Why don't we have this? It is GIS, isn't it?" For those who have yet to hear of Pictometry, Pictometry International is the world leader in digital oblique aerial imagery. And, as a refresher, a GIS is used to visualize and analyze geographic features and data related to them. So, based on that definition, Pictometry is indeed a GIS. To some of our users who perform inspections, Pictometry is an excellent way to visit a site without needlessly leaving the office. For law enforcement personnel, it is another tactical planning tool in their squad car. Most assessing staff just want to see and query parcels and street centerlines with the imagery, but the additional layers that can be added are only limited by the amount of data that you have. Users not only have high-resolution (6-inch) orthogonal aerial photography, they also have high-resolution (6-inch) oblique aerial photography as well that they can display their own data on. It has become more apparent over the last few years that people are visual, citizens are visual. In other words, they get more out of a photograph than a line drawing. Have you ever seen plans of your new office space or new home and thought how much easier it would be to "see" it if it was a picture or in 3-D? Orthogonal photography is certainly helpful to some people, but oblique imagery helps others even more. The oblique imagery in Pictometry gives users a perspective that line drawings and maps lack. There are many examples of how giving additional perspectives to people increases their understanding of what they are looking at. Architects and interior designers use three-dimensional modeling to help their clients visualize their new environment. 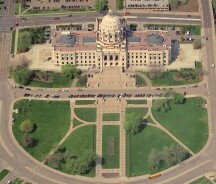 Dakota County Parks is using Google Earth to help legislators and citizens visualize needed improvements. Dakota County Environmental Management is using 3-D fly-throughs to help people visualize the impact that the former Gopher Ordnance Works munitions plant had on the lands it occupied during World War II. Planimetric datasets are still useful. In some cases the high volume usage of a product like Pictometry drives the creation and/or maintenance of centerline datasets and planimetric data sets. Art Kalinski, GIS Manager of the Atlanta Regional Commission, spoke recently of the initial resistance and then eventual acceptance that Pictometry encountered in his organization. He said that the increased usage of Pictometry created an increased awareness of GIS and the need for more current datasets, since the GIS data is re-projected and overlaid on the oblique image. Having Pictometry was a factor in pushing for creating better street centerline data and for keeping it current. This year imagery for the whole ten-county Atlanta metropolitan area is being flown. How accurate are the images? That is the other question we hear frequently. We did some testing using existing ground control that we had from other aerial photography projects. The orthogonal photography's relative accuracy was supposed to be approximately 5 meters or less over 1000 meters, and the absolute accuracy was to be approximately 2-5 meters, all dependent on the digital elevation model used. We supplied our surface data, rather than having Pictometry use the USGS 30-meter DEM. We made use of the National Standard for Spatial Data Accuracy testing procedures the best we could given the situation, and were pleasantly surprised with how accurate both the orthogonal and the oblique imagery appeared to be. But who is really using it? At Dakota County, we have 172 installs of the Pictometry Electronic Field Study (EFS) program, while many others access the imagery via the ActiveX control provided by Pictometry through our internal web mapping (ArcIMS) applications. Everyone from transportation staff to the county assessors are making site visits without leaving the office. The cities in Dakota County are our cost-sharing partners, and they have hundreds of installs of EFS as well. Pictometry has definitely caught on in Dakota County. For more information, contact Joe Sapletal at GIS@co.dakota.mn.us or 952-891-7081.